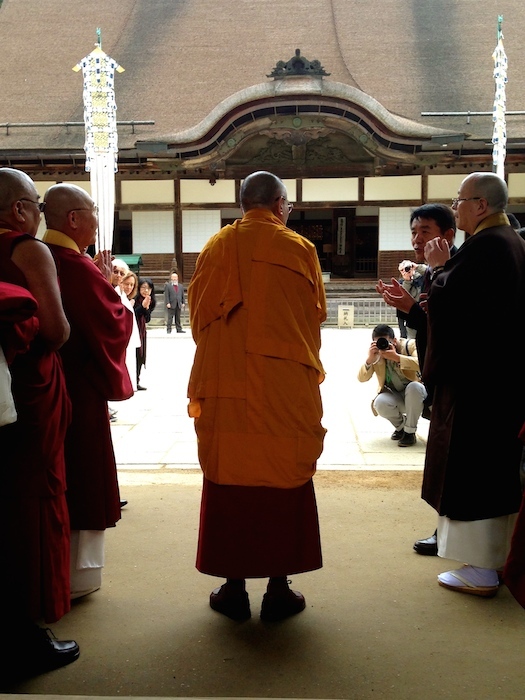 I have returned home, from my journey into the Womb World on Mt Koya in Japan and the initiation from the Dalai Lama, feeling an overwhelming sense of gratitude to all the people in my life who have helped and supported me to reach this profoundly significant point in my own spiritual life path. During this journey I was very privileged to have been entrusted with the prayers of several hundred fellow pilgrims, which I offered at the sacred places I encountered on my pilgrimage and which were ritually burned at the end of my journey. My own prayer now is that I can find skilful ways of passing on the great blessings I received during this time on the mountain to everyone I meet so that this flow of blessings can ripple out into the world. 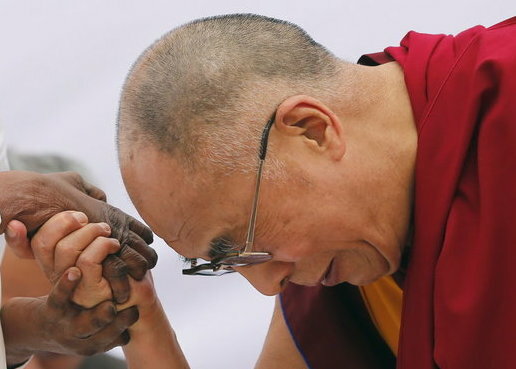 I will write further about this experience in subsequent blogs, as the teachings I received – from my own teacher, from the Dalai Lama, from the mountain spirits – settle into me and I can find adequate words to describe what precious lessons I learned. For now, I would like to share with you two experiences I had during my pilgrimage. The most sacred place on Mt Koya is the Gobyo, the shrine where Kobo Daishi (774-835), the founder of the Shingon school of Esoteric Buddhism, is interred and is believed by many to be still living, seated in a state of perpetual meditation. As well as being the starting and finishing point for the 1,200 kilometre Shikoku pilgrimage, pilgrims come here from all over Japan to ask for Kobo Daishi’s help with problems in their lives. Every day during my own pilgrimage in Mt Koya I visited this sacred place as part of my ritual practice. 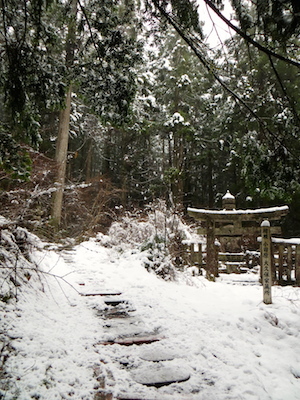 On one particular day it was snowing hard and the two-kilometer path through the ancient cemetery of Okunoin that leads to Kobo Daishi’s inner sanctum was treacherously slippery and hard going, and there were very few pilgrims about. However, while I was reciting prayers in front of the shrine, a very old man came and stood before the shrine, dressed in pilgrim clothes of white and wearing a pilgrim’s straw hat, now dusted white with snow. He held the hand of a middle-aged woman, who was intellectually disabled and had difficulty walking, taking small staggered steps and holding firm to the old man’s hand. As he explained to her in a quiet, gentle voice, like speaking to a small child, that he was now going to say prayers and instructed her to stay close to him and not walk away, it became clear that the woman was his daughter. The old man released his daughter’s hand so that he could hold his rosary beads in one hand and a small, well-used prayer book in his other hand. He lit a stick of incense, placed it in the brazier, and began to quietly and fervently pray. His daughter watched the puffs of steamed breath coming from her father’s mouth and found this very amusing, so she made huffing breaths of her own and delighted in the little clouds of smoke-like vapour coming from her mouth, laughing at the way the vapour moved over and around her father’s head. She then puffed out clouds closer up into her father’s face, mingling with his breath and continued huffing breaths around his head and neck. In the process of her happy game, she accidentally knocked off his pilgrim hat, but her father didn’t stop his praying to pick up the hat or to admonish his daughter, but just kept chanting in a rhythmic, lilting voice. When he finished his prayers, he stooped and retrieved his hat; then, taking his daughter’s hands in both of his, he caught her attention and looked intently into her eyes, whispering something urgent and intimate. Then he just stood there for a moment in silence, holding her hands, with tears streaming down his withered old cheeks as the swirling clouds of their breath intermingled. His gaze was one of complete and unconditional love. Then he said, “Would you like a cake now?”, and in response to her wide smile and nodding head, he took he hand and led her away, back out into the snowy landscape. I wondered what pressing prayer had driven him through the snow with his daughter to get here – was it perhaps a concern about who might care for his daughter upon his death? There was something deeply humbling in his act of prayer, and the purity and complete openness of that gaze of unconditional love for his daughter had pierced my heart, so I stayed and prayed fervently for their well-being and protection and that whatever he had asked for would be received. This entry was posted in Inspiration, Spirituality and tagged blessings, Dalai Lama, Kobo Daishi, Okunoin, Womb World Mandala. Bookmark the permalink. Cate! I’ve been hoping to see a posting from you to know you’re back home safe and well and that your Womb World journey has fulfilled your hopes as a pilgrim and prayer vessel. Such incredible experiences you’ve described for us. I’m not surprised the tears flowed when the Dalai Lama looked into your eyes, the eyes of a fellow pilgrim on the path to Enlightenment. I’m so thrilled that I managed to get my prayer to you just in time! Welcome home dear Cate and thank you for all you do in devotion to Kuan Yin and the greater world of Buddhism. Thank you once more for your beautifully descriptive writing. It was so easy to imagine your journey especially as it came to us with the calm and peaceful pictures of the snow. An important experience in your life enhanced by the true story of the old man and his daughter. Thank you so much for sharing your experience with us all.